Also available in ebook, hardcover, or paper format from Amazon. I have signed copies for the special price of $24 in the US. The race to make the laser would bring one man the Nobel Prize and a second tens of millions of dollars in patent royalties, although neither would succeed in making the world's first laser. It began with a conversation between two men at Columbia University's physics department in October 1957, shortly after the Soviet Union had orbited Sputnik 1, the world's first artificial satellite. Charles Townes, at 42, was already an eminent professor, with an international reputation for developing the microwave maser. Gordon Gould, at 37, was a graduate student who was supposed to be writing his dissertation. Townes was looking for a way to extend the maser principle to produce an oscillator which emitted visible light, and was interested in work Gould had done on this dissertation project. Gould had also been thinking about making an optical version of the maser; the idea was in the air at Columbia because it was a logical step. When the conversation was over, the two went their separate ways. Townes settled down in his dogged, systematic way to deduce the best way to make what he called an "optical maser." He enlisted an old friend,, his brother-in-law Arthur Schawlow, who was working at Bell Labs and had a background in optics that complemented Townes's knowledge of microwaves. The two carefully analyzed the requirements for making a laser, not expecting competition from Gould. Gould knew that Townes would be tough competition, but he also realized that the laser could be the biggest thing in his life. Gould's dream was to be an inventor, not a scholar. He often seemed to lack energy, but the vision of the laser filled him with a manic intensity. Familiar with optics, he intuitively realized that the light oscillator he envisioned would generate a tightly focused beam of light, and when he sketched it in a composition book, he named the device a LASER. The idea was the easy part. The challenge was turning the theory into reality. It would take finding new materials, ways to excite them to emit light, and optics to make the light build up into a beam. After outlining the principles with Schawlow, Townes turned the task of development to Schawlow and others at Bell Labs, and to a pair of his graduate students at Columbia. Gould went to work for a small defense contractor named TRG, and hustled a hefty military contract to build a laser -- but he could not gain the security clearance he needed to work on the laser contract. Meanwhile, a bright young physicist named Theodore Maiman at Hughes Research Laboratories in California had also become intrigued with the laser idea. He had plenty of company; others also saw the promise of the new idea. Maiman decided to start with ruby crystals, which glowed red when illuminated with a bright white light. Schawlow had said ruby generated light too inefficiently to work as a laser, but Maiman had worked with ruby before, and wondered how ruby was losing energy. A series of careful measurements convinced Maiman that Schawlow was wrong. While Bell Labs, Columbia, and TRG struggled with a variety of difficult materials, Maiman designed a little laser, with a fingertip-sized ruby cylinder placed inside a spring-shaped photographer's flashlamp. The first time he cranked up the voltage on his flashlamp, the little ruby cylinder fired laser pulses. The laser age began in May 16, 1960. It should have been easy after that, but the editor of the country's top physics journal, Physical Review Letters, summarily rejected Maiman's report of his breakthrough. He had to make the announcement at a press conference, and at first many still hesitated to believe. But then TRG made their own ruby laser, based on Maiman's design, and Bell Labs followed. The dark horse had won the laser race, and later many honors. But in time Townes would win the Nobel Prize, and Gould would earn millions in patent royalties. 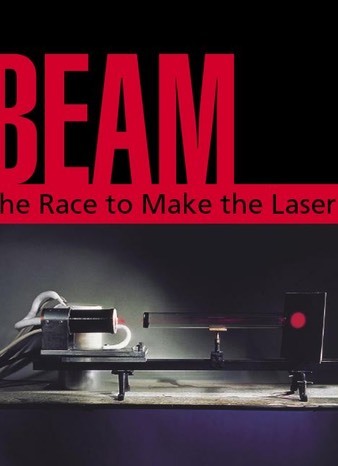 Read all about it in Beam: The Race to Make the Laser. Signed copies available from the author for $24.00 including postage and handling.